Bespoke Event Production. Whatever your industry we’re in the business of creating spectacular events that are out of this world. Enlightened have been working on corporate events since the company's formation and have gained a wealth of experience and a history of very satisfied clients. We understand how important attention to detail is for our clients and our experienced, professional crew and technicians know just how to realize your events potential at every stage of the process on time and on budget. 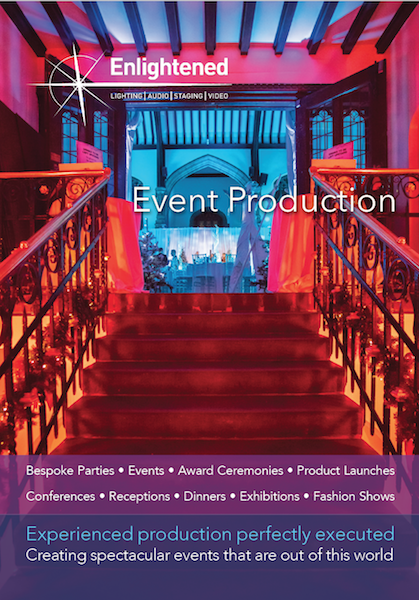 Our talented and seasoned Production Team are there to help and advise you at every stage of your events planning. We stock a huge variety of equipment available for immediate hire, which combined with our Production Team’s expert technical knowledge ensures your event is in safe hands. Whether large corporate conference and dinner or small intimate private wedding, our team are here to help you realise your events potential. We provide full production technical support including: Lighting – Audio – Staging – Video, for every type of event Including: Award Ceremonies – Product Launches – Conferences – Receptions – Dinners – Exhibitions – Weddings - Fashion Shows, to name but a few. Our dedicated Production Managers are experts in providing creative technical solutions whatever your projects size and budget.